If your home is your castle, why not let your guests know before they even walk through the door? We have the fantasy, medieval, and gothic door knockers to do so here. Shop here for door knockers in styles that range from macabre to regal. 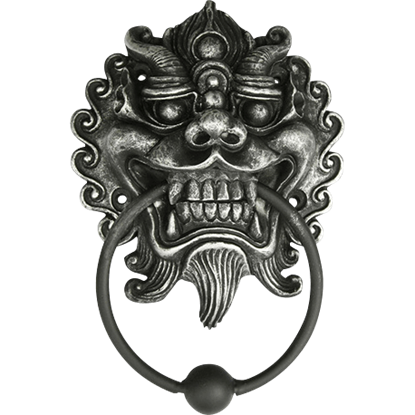 We offer dragon door knockers and gargoyle door knockers that are well-suited to medieval, Renaissance, and gothic displays, as well as skull door knockers and zombie door knockers that will emphasize the eeriness of your domain. 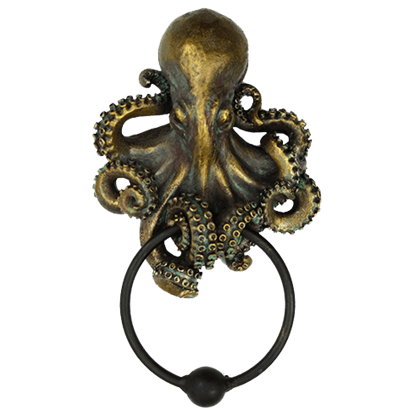 Check out octopus and steampunk door knockers in beautiful antique brass tones that will give your home the feel of a steampunk submarine or Neo Victorian manor house. No matter your style, show it off with our novelty door knockers. Cast of iron and aged with an antique finish, this lion door knocker looks as if may have once stood watch upon an old castle door! This rustic aged lions head is surrounded by a band of braids. 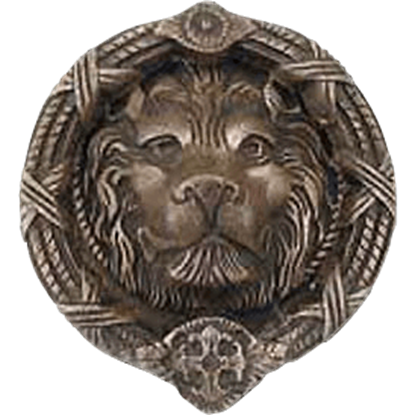 The Lion Door Knocker is a perfect gift. Your house will be the favorite on the block during Halloween night with this creative door knocker announcing trick-or-treaters. 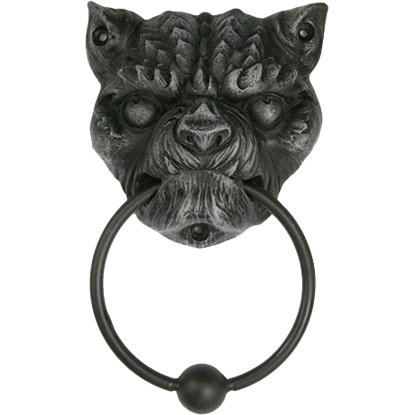 The Chimera Door Knocker features the fanged head of an animalistic chimera with a ring in its mouth. Every castle has got a stylized knocker on its door. Your abode should follow suit! 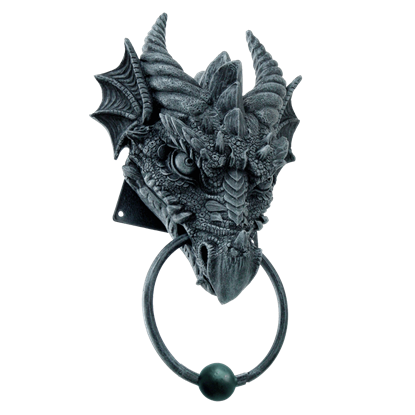 For those who love dragons, this Dragon Head Door Knocker is the perfect accent, featuring equal measures of fantasy design and medieval style. Pretend that your front door is the entrance to a large, spooky mansion when you make this door knocker a part of your decor. 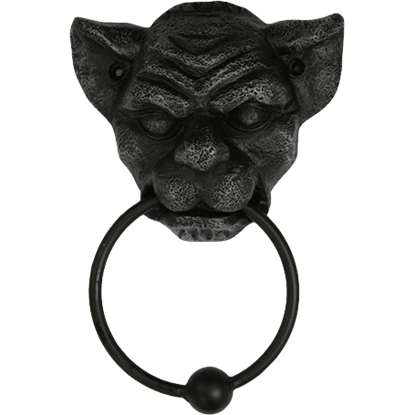 The Gargoyle Door Knocker features the wrinkled face of a chimera with a ring hanging from its mouth. Skulls can fascinate and repel in equal measure, serving as reminders of death in macabre fashion. 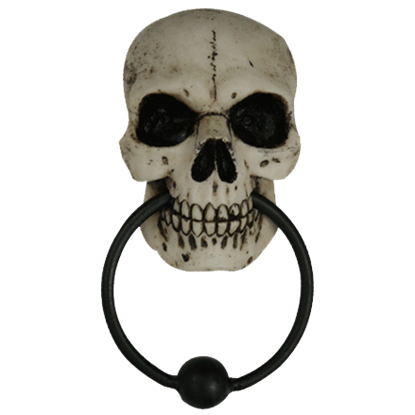 The Gothic Skull Door Knocker depicts a skull suspending a smooth door knocker ring with bob in its teeth. 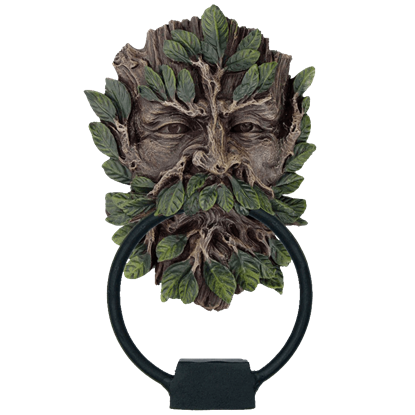 Not only is the Greenman Door Knocker a fantastic way to greet your guests with rustic style, but it is the perfect way to ensure those guests can let their gracious host know that they have arrived, all with a single timely knock. 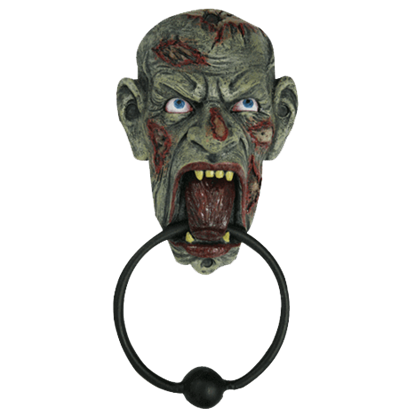 Zombies hunger for the flesh of the living, making the open maw of the Hungry Zombie Door Knocker a creepy decoration to guard entrance to your home. 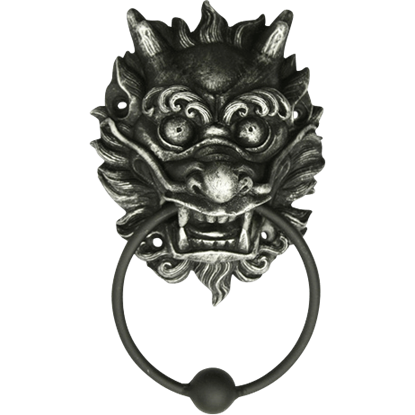 The door knocker ring with bob hangs from its jaws and yellowed teeth. Not all visitors are friendly. You will not even need to be prepared, though, if you can turn all your hostile trespassers to stone without lifting a finger. 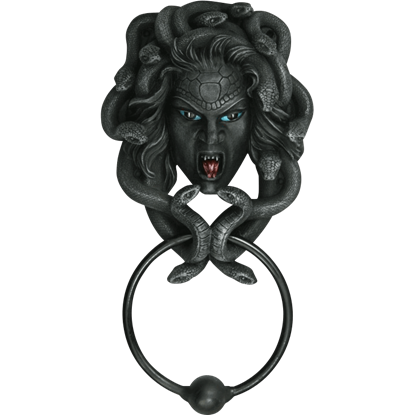 The Medusa Door Knocker makes a great accent to the homes of mythology buffs. Welcome all of your visitors to your humble abode with this decorative aquatic doorknocker. 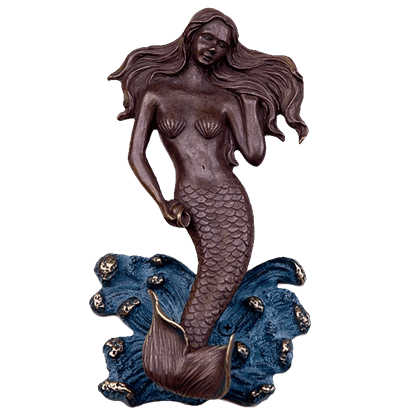 The Mermaid Doorknocker features a graceful mermaid figure with long, flowing hair rising on a splashing blue wave. Perfect for homes in the depths of the ocean, or for any fan of nautical steampunk decor, the Octopus Door Knocker is an great way to display the wonders of the sea on your own front door with eye catching, hand painted detail.